A device that can 'mimic the action of the front end circuitry of the retina' and send images directly to the brain is being pioneered by a Weill Medical College of Cornell University team. View this excellent TEDMED talk by neuroscientist Sheila Nirenberg for more details. 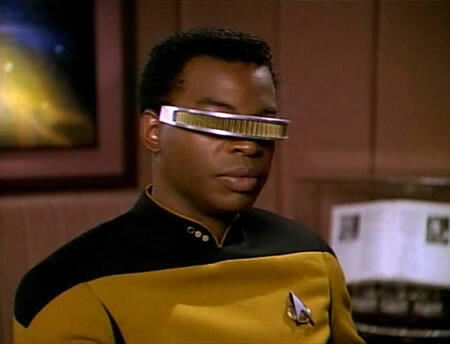 Star Trek fans have been waiting for Geordi la Forge's VISOR (or something like it) to send images directly to the brains of people who have lost their sight. Update 27-Feb-2017: Take a look at the vision strip from Orphans of the Void (1952) by Orville Shaara. End update. From Daily Mail; thanks to Moira for sending the tip and the reference (thereby rousing me from my sickbed! ).